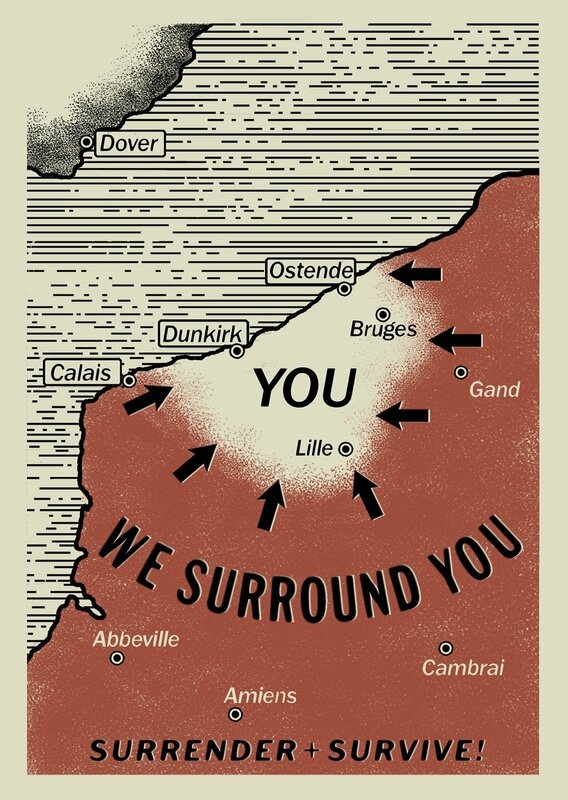 There has been a lot of discussion of Christopher Nolan's DUNKIRK running through my life the last two weeks. Much of the discussion has been because I am not absolutely in love with the film and many of my friends are. I've also engaged online with some others who are incredulous (and occasionally downright mean) that I am not as rapturous as they are. There was one person who was so incredulous as to be implying that those of us who aren't drooling over the film are simply being contrarian just to be contrary. No. The film just didn't click with us the way it did with you. And as was made clear by some of the discussions where "better" films were offered not only do we have differing tastes but we've seen a many different movies than each other. I'm certain that had we had the same cinematic experiences some of us might have come to the same conclusion as you. Since we are not the same different feelings resulted. While I do like DUNKIRK I'm not certain that it's the greatest war film that many online writers seem to imply. Over the last few weeks I've been running into an interesting trend in the cinema corners of the internet where the fans of DUNKIRK have been reacting to some of the negative or at least less than loving reaction to the film with the response "but haven't they read the interviews, that is explained in the interviews" and "they should go read the interviews its all explained there". The film's and Christopher Nolan's fans seem to think that if we all read everything that the director had to say about the film we'd love it just as much as they do. Its a nice idea but there is a problem there, in that the vast majority of people aren't going to care enough to read one interview never mind multiple. People will read a little, maybe a review or two about a film, and then head to the theater or fire up Netflix or turn on cable. Most people are not going to read tons of interviews, or any interviews (unless its in people or EW) just so they can truly understand why a filmmaker made certain choices. Most people just don't care why Nolan chose not to show blood and gore, or why any filmmaker did or didn't do something they just want a good movie. The film fanatics don't understand that no one really cares about the things they care about. I know I've lived it. I live in this weird twilight world. While I have been described as a psychotic film fan who watches everything, I am also a writer on film who treats film with a certain amount of respect. I walk this tightrope between the fanboy and the critic frequently falling off the rope into one thing or the other. I can gush about a no pretense horror film one minute while talking up the deeper meanings of a more serious film the next--and vice versa (more often vice versa). I take every film as it hits me and on it's own terms. What does on it's "own terms" mean? It means I go into a film largely blind, with newer stuff that means with maybe reading a review or two, with world premieres it means without reading the press notes. I go into a film as blind as I can, which with the epic films like DUNKIRK means my blindness is relative. The idea is that I'm taking the film as the majority of filmgoers are going to see it- with little background information. The reason I do this is because way too often I've run into problems with films (CORPO CELESTE and WHITE WHITE WORLD spring to mind) where nothing the director was trying to express was not in the film but it was all in the notes. I don't want an "ah ha" moment hours after I see a film nor do I want to have to know everything about a film before I see it. As I have said these last almost eight years of writing Unseen Films MOVIES MUST WORK UNTO THEMSELVES. If they can't work unto themselves then they really don't work. With Nolan's DUNKIRK , it largely works but there are missteps. I can live with the lack of blood, which was the discussion on Twitter that sparked this piece. But there are other problems, which are problems no matter how much supporters of the film don't think they are. The first problem comes from Nolan's dropping us into the even with almost no explanation. I have been reading on the evacuation all my life so I understand what the details were. I have had discussions with people who have compared it to films such as LA 92 or Joseph Wiseman's documentaries. I had a long discussion about Wiseman's esthetic and the film. I see that and I understand it and completely get it. The problem is I've read some on line discussions and I've had some in person discussions where people didn't really understand the history of what happened. The film has dropped us so far into the event that unless you know what happened you're going to feel lost. I know many of you reading this are going to go "but it's Dunkirk how can they not understand what it is" Well it was 75 years ago and our cultural focus has shifted. Let me ask you- without looking it up- do you know what Dien Bien Phu is? Aside from a lyric in a Billy Joel Song? How about the Biafran conflict? Gulf of Tonkin? They are closer in time but I'm pretty sure most of you don't really understand them or even know what they are. The request for context by some people have made a few of the film's fans angry who have called them stupid for not knowing. I find it interesting since when I asked one belligerent fellow person why he knew so much he said that he read up on the battle before the film was released. Clearly he didn't understand that his knowledge didn't spread to the rest of the world nor did he realize some people don't feel the need to do homework on every film they see. That the questions are being asked by more than a handful of people suggests that however "great" the film is, it is not quite the godsend that many feel. Clearly there are issues that have prevented the film from connecting to everyone with it on face value. That we should be told to read the interviews or do more research, forgets the notion that the film is not part of a life exam. Additionally it really doesn't matter if we don't like your favorite film of the moment and we shouldn't be asked to do additional study on the slim chance we might agree with you. That many of us aren't wetting ourselves over the film I think says that we have different takes, different experiences and not as some have implied, idiots. Some of the discussions that I have seen or been part of about DUNKIRK and a few other recent films have kind of shaken me to the point where I'm seriously considering stepping away from some of the film world I travel through. The raging love for some films, and some directors by some film fans has bordered on pathological. The epithets thrown my way, even by people who casually know me is disheartening. Guys and girls these are only movies and whether we like them or not doesn't really impact your existence. Personally I am a champion for dozens of films you would spit on but which touch my soul. I don't attack or belittle people who don't like my choices. You shouldn't either. That I don't love DUNKIRK shouldn't make any difference to you- especially since odds are that other than the stray comment that disagrees with your stance you'll never have another interaction with me and only for that two second reading of my worlds will I mean nothing to you. Besides odds are in six months something is going to come along and make you think that's the greatest film of the year all over again. ...however those going into it blind will no doubt have the the same confused reactions.